TheTownCrier: Victory Gardens! Kill 2 'birds' with one stone....GROW Something! More endorsements for Duncan Hunter '08! Betrayed by the Senate and White House again! Victory Gardens! Kill 2 'birds' with one stone....GROW Something! "This poster was part of the publicity for a brilliantly mounted campaign to encourage the use of homegrown foods. 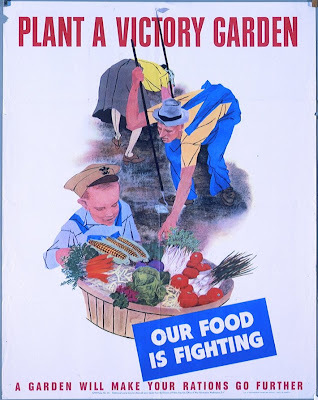 Because commercially canned goods were rationed, the Victory Garden became an indispensable source of food for the home front. The Victory Garden was a household activity during the war and one of the most well received of all home front chores. At its peak, it is estimated that nearly 20,000,000 gardens were grown and about 40 percent of all vegetables produced in the U.S. came from Victory Gardens. By the end of the war the Department of Agriculture estimated total home front production of over one million tons of vegetables valued at 85 million dollars." The headlines this week were so special! ..... The White House/ Senate are trying their best to convince you that amnesty ain't amnesty! ...... Mexico along our border has broken out in drug cartel anarchy. So many people being murdered down there it looks like Bagdad! GROW SOMETHING! If you can keep a house plant alive, you can grow something to eat! Worried about the food supply? GROW something to eat! One tomato plant or one pot full of lettuce - GROW something. You'll dispense with part of the 'need' for 'guest workers' and you'll know it's safe. Most of your tomatoes at the store are grown in Mexico, where they have no restrictions on the chemicals or cleanliness. Check the boxes if you don't believe it. Besides, don't you think you're supplying Mexico with enough of your dollars? During World War 2, our parents and grandparents did it. It made a difference of 85 Million 1945 dollars. Don't we have any of the 'stuff' left that those good people had to do the same? Check the web. You can find out how to grow anything. A tomato plant is as attractive as most exotic house plants - put the thing in your window if you have to. Terry also reminded us that this country doesn't belong to George Bush. It belongs to us. He has no right to give it away.
" You can't eat stuff grown by people who are out to conquer you."